There are 14 replies in this Thread. The last Post ( Dec 15th 2018 ) by Michael. 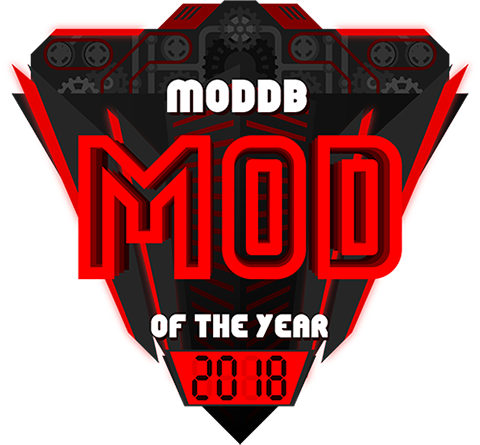 The search for the 2018 Mod of the Year has begun on ModDB, a voting booth for your fans has been added to your mod profile on the site. Rally your community, make some noise and lets celebrate mods! For the next 10 days visitors will be voting for your mod, to help us decide the Top 100. To get votes for your project, simply link your fans through to your mod profile on ModDB. We've got a widget and buttons to make this easy. We had 7,000,000 visitors in 2017, lets try and beat that tally and encourage more games to embrace mods not DLC. Now is also the time to share those awesome news posts, developer diaries and postmortems you've been saving up. Nominations run from December 1st to 11th, Top 100runs from the 11th to 21st, with the winners announced around Christmas. Everyone from your community who votes has a chance to win game keys at random from our #modlove collection so get involved and enjoy our yearly awards! Happy voting! Edited once, last by Martind Forlon ( Dec 1st 2018 ). @(IOC)Wanderer : someone me remember here? Edited once, last by NEMAZ ( Dec 1st 2018 ). (IOC)Wanderer : someone me remember here? For people who played CF 1.82 the name >X<-Alien->X< is hard to forget Hope to see you in game again! count me in. still have my vote. Yesterday i gave my vote. Today i voted again. Tomorrow if i'm here i will do it once again.